So I think the question pretty much covers it, I have a number of columns in a sharepoint 365 list which are searchable, results appear for items already created before the crawled property was mapped to the managed property however anything new then does not appear in the search. For example I have job 1,2 and 3, with jobs 1 and 2 being created before the mapping and they appear in the search. I then create job 3 and it will not appear in the search regardless of time passed. Any help would be much appreciated. Does it a site column or just list column? What is the type of the column? Make sure the managed property is searchable. 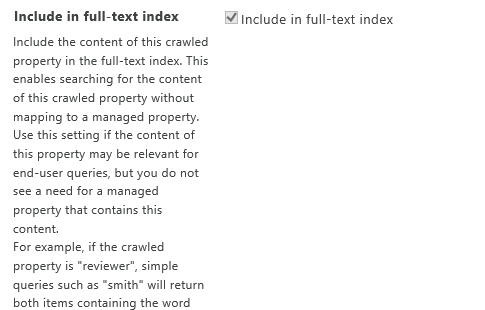 And the crawled property is Include in full-text index. Not the answer you're looking for? Browse other questions tagged sharepoint-online managed-property crawled-property or ask your own question. What are the managed/crawled properties which are related to the publishing startdate and publishing enddate? Managed Property mapped to Crawled property appears twice in Search Schema?